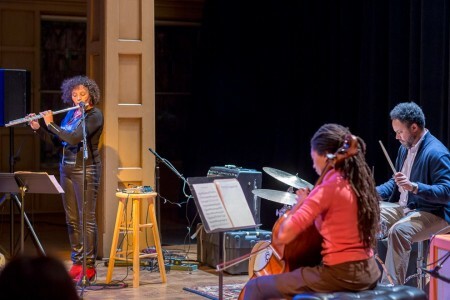 After 15 years of collaborations in a variety of ensemble contexts, the all-star trio of Nicole Mitchell, Tomeka Reid and Mike Reed come together to celebrate their long-term relationship and their common cultural and aesthetic threads. All are members of Chicago’s Association for the Advancement of Creative Musicians, and served on the organization’s executive board from 2009 to 2011. Their forthcoming album celebrates some of the music composed by AACM members over the past 50 years, dipping into the fathomless well of its musical history. Cellist, composer, and educator Tomeka Reid is equally adept in classical and jazz contexts, but predominantly finds herself in experimental and improvisatory settings, and composes for a wide range of instrumentation, from big band to chamber ensemble. Ms. Reid’s music combines her love for groove along with freer concepts. She is an integral part of Dee Alexander’s Evolution Ensemble, Nicole Mitchell’s Black Earth Ensemble, Mike Reed’s Loose Assembly, the AACM’s Great Black Music Ensemble, and co-leads the internationally recognized string trio, Hear in Now with Italian bassist Silvia Bolognesi and New York violinist and vocalist Mazz Swift. She has worked with Anthony Braxton, George Lewis, Roscoe Mitchell, Jeb Bishop, Myra Melford, Fred Lonberg-Holm, Mary Halvorson, Denis Fournier, Edward Wilkerson and Harrison Bankhead. Ms. Reid also leads her own trio featuring guitarist Matt Schneider and bassist Josh Abrams. Nicole Mitchell is a creative flutist, composer, bandleader and educator. As the founder of Black Earth Ensemble, Black Earth Strings, Ice Crystal and Sonic Projections, Mitchell has been repeatedly awarded by DownBeat Critics Poll and the Jazz Journalists Association as “Top Flutist of the Year” for the last four years (2010-2014). Mitchell’s music celebrates African American culture while reaching across genres and integrating new ideas with moments in the legacy of jazz, gospel, experimentalism, pop and African percussion through albums such as Black Unstoppable (Delmark, 2007), Awakening (Delmark, 2011), and Xenogenesis Suite: A Tribute to Octavia Butler (Firehouse 12, 2008), which received commissioning support from Chamber Music America’s New Jazz Works. She formerly served as the first woman president of Chicago’s Association for the Advancement of Creative Musicians, and has been a member since 1995. Ms. Mitchell is currently a Professor of Music, teaching in “Integrated Composition, Improvisation and Technology,” (ICIT) a new and expansively-minded graduate program at the University of California, Irvine. Mike Reed is a musician, composer, bandleader and arts presenter. Over the last two decades he has emerged as a dominant force within Chicago’s diverse artistic community, both through the music he makes and the live events he produces. He leads the bands People, Places & Things, Living by Lanterns (an octet that includes guitarist Mary Halvorson, cornetist Taylor Ho Bynum, drummer Tomas Fujiwara, and saxophonist Ingrid Laubrock), and Loose Assembly. He also forged collaborative relationships with legendary musicians such as reedist Roscoe Mitchell and trumpeter Wadada Leo Smith. He’s a member of Chicago’s Association for the Advancement of Creative Musicians, where he served as vice-chairperson between 2009-2011, and is founding director of the Pitchfork Music Festival, the current programming chair of the Chicago Jazz Festival, and the owner and director of the acclaimed performing arts venue Constellation. Presented by Nonsequitur in cooperation with the 2015 Earshot Jazz Festival.